SEOUL, Oct 1 (Yonhap) -- The two Koreas on Monday began their work to remove landmines in parts of the Demilitarized Zone (DMZ) separating them, in line with a recent agreement to reduce tensions and prevent accidental clashes, Seoul's defense ministry said. 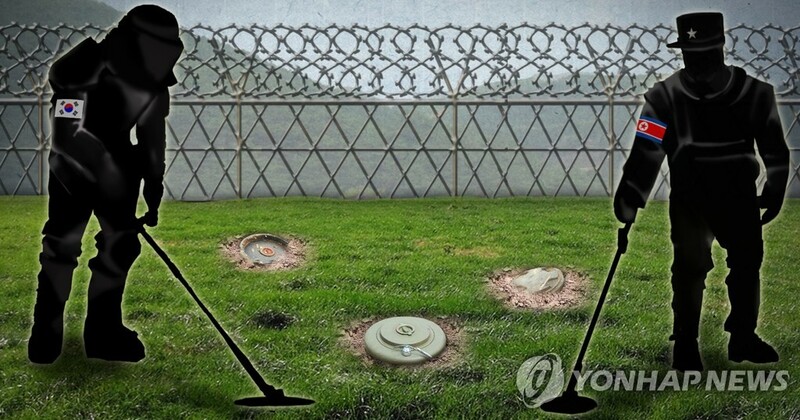 "Regarding the landmine removal work as the starting point, the military authorities of the two Koreas will make joint efforts to ensure that their military agreement will be carried out systematically and normally," the ministry said in a press release. Amid the work in the JSA set to last for 20 days, the two Koreas and the U.N. Command (UNC), which oversees activities in the DMZ, are expected to launch trilateral consultations over a range of issues, such as how their troops will operate following their disarmament. The agenda may also include the idea of stationing 35 troops each from the two Koreas in the JSA for joint security operations. The troops in the JSA used to be allowed to freely move across the military demarcation line (MDL) before the 1976 "axe murder incident" in which North Korean soldiers killed two U.S. soldiers who were trimming a tree in the DMZ. After the incident, the troops, now armed with rifles, were banned from crossing the MDL. The work to eliminate landmines in Arrowhead Ridge in Cheorwon, a site of an intense battle during the Cold War conflict, will continue until Nov. 30. The remains of some 500 troops, including around 300 UNC troops, are estimated to be buried in the ridge. The two Koreas are set to conduct the joint excavation project in the Cheorwon area from April 1 to Oct. 31, 2019.